From the Pacifica Series, this Yamaha PAC112V Electric Guitar really steps it up, offering a solid alder body with pro-level hardware and electronics - an amazing value in its price range. 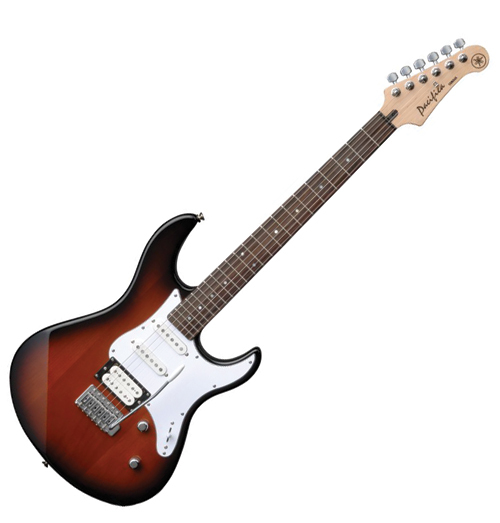 It comes with a classic comfort-contoured body, bolt-on maple neck with rosewood fingerboard, vintage-style vibrato, and 5-way switching of the H-S-S pickup configuration. Other standout features include an Alnico V humbucker with coil-splitting, block saddles, upgraded chrome hardware, and knurled master tone and volume knobs. Alnico V magnets are used for both single coil and humbucker to deliver a clear strumming tone with good projection plus a tight sound that doesn't get buried in the ensemble. A coil tap function on the rear humbucker delivers a delivers a wide range of tonal possibilities, from hard distortion to an edgy single coil tone. A switch in the tone knob allows quick switching between humbucker and single coil tone. Setting the pickup selector to the 4th position automatically selects the coil tap function that delivers a clear halftone from the pair of singles. The block saddle type vintage tremolo offers excellent operation. The heavy block type saddle delivers rich sustain and deep tone. Like the top-end PACIFICA models, the rear pickup is mounted directly to the body. This configuration captures body resonance, delivering greater dynamic tone rather than pickguard mounting.